On Wednesday's We Wear Pink! Wow mean girls is ten years old! It's crazy right? It just doesn't feel like that long ago. 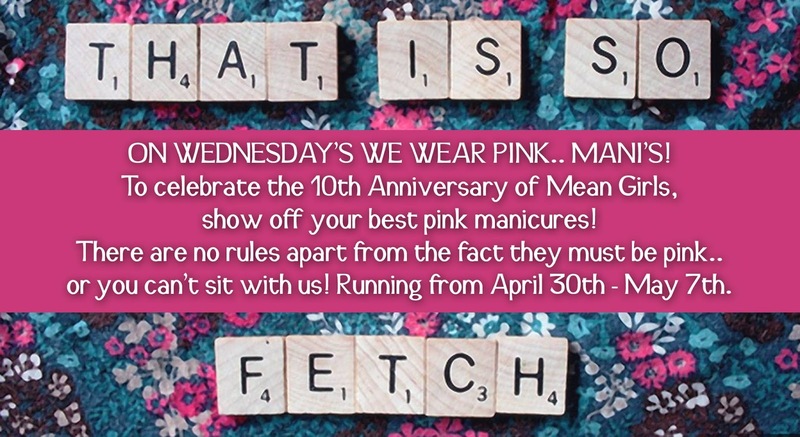 Nail Bloggers have done pink Wednesday's for a while but today we are all coming together for a special day. All wearing PINK! Yay! The excitement! This beauty is Lumina Lacquer Graduate, a strawberry milkshake shade of pink scattered with every neon glitter you could ever dream of. Appliaction was a little tricky with this one but it was due to the sheer amount of glitter in this. I used three thin coats and then Seche Vite topcoat to smooth down any bumpy glitters! This is such a fun and interesting shade and I think is perfect to sum up Mean Girls! It's so fetch, right? Nice pink manicure to celebrate!